The U Fistinu of Saint Rosalia is one of the most famous and popular festivals in Sicily. The birth of the first Festino of Saint Rosalia was in the year 1624 on Pellegrino mountain, when the Saint appeared in a vision to a hunter from Palermo. During the week of the feast leading up to 15 July, the city of Palermo becomes a natural, open-air theatre. An incredible 50-foot-high float (called the carro), made of wood, cardboard and cloth, parades through the streets of the town. Inside the float there is a musical band and on top of it, on the altar, there is the statue of the Saint and the famous 17th Century silver urn that contains the Saint’s relics. The feast features such delectable treats as tiny snails and ice-cream-like puddings. It reaches its climax with a colourful two-kilometer ‘tableau vivant’ featuring Cuban dancers, African drums and traditional religious choruses followed by a fantastic fireworks show. In recent years, the festival has so elaborate that it attracts over 200,000 visitors. Carnevale is the best time to visit Acireale, in February. There are festivities for carnival all over the island but this town puts on one of the best, which puts it in our top 5 festivals in Sicily. The stars are elaborate floats decked in techni-colour floral displays, some carrying papier mâché caricatures of local celebrities. All around bands play and costumed dancers leap about under raining confetti. Exact dates vary each year. Cous CousFest is a unique festival celebrating couscous as a dish of peace and brings together a diverse range of cultures. Visitors are offered the chance to taste 30 varieties of couscous from all over the world in the traditional couscous houses along San Vito Lo Capo streets. The festival boasts a wonderful array of cooking demonstrations by top Michelin chefs and two competitions, The Italian Couscous Championship and the Couscous World Championship. Also on offer are a range of free concerts, exhibitions and talks. Sherbeth Festival or the International Festival of Ice-cream is one of the best festivals in Sicily for those with a sweet tooth. The historical centre of the Sicilian capital turns into the Village of Ice Cream. Learn about the history of ice-cream and taste many interesting variations. Ice-cream makers can be seen in an open-air laboratory, where it is possible to discover ice-cream secrets from around the globe and see them express their creativity. Tastings, debates, concerts, activities for children and courses for aspiring ice-cream makers are all part of what is on offer. 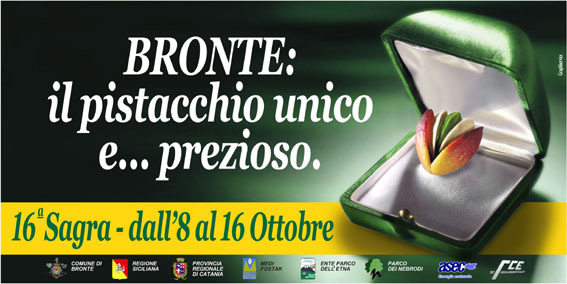 Festival of the Pistachio of Bronte . Pistachios are one of the key ingredients of the culinary traditions of Sicily, from appetisers to seasoning for pasta, from sauces to desserts. Bronte, a lovely town situated on the flanks of Mount Etna within the Natural Park of the volcano, is the world-famous capital of pistachios, where an annual festival to celebrate the ‘green gold’ takes place in September and October. During these days, this fascinating town brings all the typical traditions of the Sicilian countryside back to life. The historical centre is full of stands where local producers, farmers and artisans show all their specialities. Tasting sessions of pistachio-based recipes happen during the weekend, together with live cooking, seminars, live shows and other entertainment. The atmosphere is jazzed up by live performances of street artists and music bands scattered around the town.